Who Loves Plum Colored Leaves of Chinese Fringe Flower? 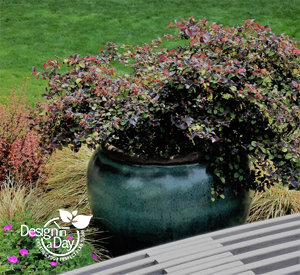 As a Portland residential landscape designer, I have many clients who want exciting year-round color in their landscapes. If they love burgundy foliage (either you love it or hate it, it seems) I often consider Chinese fringe flower as a shrub for their landscape. While there are lots of plants these days with red or burgundy foliage, we only have one that holds it’s leaves year round. 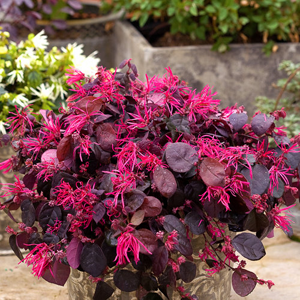 Chinese fringe flower (also called Chinese witchazel) – Loropetalum chinense var Rubra. Chinese fringe flower has to be planted in the right location to be able to look good in the winter. I’ve had plants that lived through the winters but look sad with dried out winter burned leaves which is very disappointing if it’s part of your winter view. I had clients who loved it so much for their entry that we tried it in the “wrong place” for about 6 years hoping we would get lucky. It looked fantastic May to December but some years it looked horrid January to May…..we finally gave up. My best location advice for this plant is three fold: good soil drainage (planted up on a slight mound or above a rock wall), protection from the east wind and no sun until mid-morning. 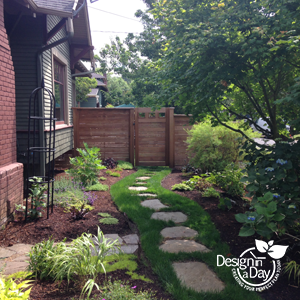 A house, tall evergreen trees or a hill can block both the east wind and early morning sun. It is not a shade plant and will have only green leaves in too much shade. Too much hot afternoon sun can scorch the leaves. Conversely, or maybe I should say perversely, I have seen a few plants thriving that get 6 am sun. While this puzzles me a little (plants do not read about themselves in plant books after all) where there are successful plantings of Chinese fringe flower, good drainage and some afternoon sun are the common denominator. Should I live to be 100 (and still be practicing as a garden designer), I will not have the exact answers to some plant peculiarities. 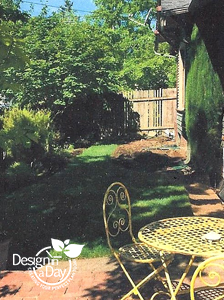 I have created hundreds of landscape designs here in the Pacific Northwest to inform my opinions but plants may be a bit like cats…..they surprise us with their likes and dislikes. Low maintenance yes or no? 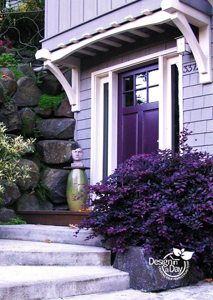 When sited correctly it is fabulous and gives your landscape a unique focal point. I don’t consider it an easy going low maintenance plant since it may need to be moved or replaced to site it properly. Once it has settled in and is a mature plant, it will need to be irrigated regularly. It will need occasional pruning if it gets too big for the area it was planted in. It’s easy to underestimate how big they will get over time. There are now several different varieties claiming to be compact, but I am skeptical. Heuchera ‘Midnight Rose’ is a polka dotted burgundy and hot pink foliaged coral bell courtesy of that wild plant designer Dan Heims at Terra Nova . This is a seriously fun combo for clients who like wild color. 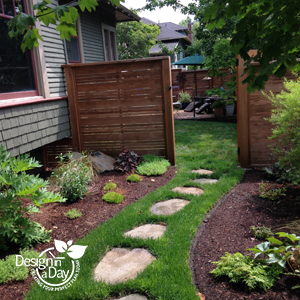 Ornamental grasses, heather and dwarf conifer look great with this plant. Chinese fringe flower looks good with many kinds of plants and garden styles from modern to cottage garden. It’s a very versatile plant. ‘Purple Pixie’ also called ‘Peack’ has a nice shape for growing in a pot. It is supposed to be more compact. 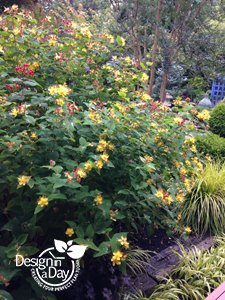 Count on pruning it back by ½ every year after it flowers to keep it a compatible size for a patio or entry area. ‘Pipa’s Red’ can be grown as a small tree or large shrub or can be sheared back by ½ or more every year after flowering if you want it to be a 3′ to 5’ tall shrub. ‘Zhuzhou Pink Fuschia’ is also a delight. I’d use it as a small tree or hedge in a landscape design.